Portsmouth was founded by Colonel William Crawford, a member of the Virginia House of Burgesses. It was established as a town in 1752 by an act of the Virginia General Assembly and was named for Portsmouth, England. In 1767, Andrew Sprowle, a shipbuilder, founded the Gosport Shipyard adjacent to Portsmouth. The Gosport Shipyard at Portsmouth was owned by the Commonwealth of Virginia after the American Revolutionary War and was sold to the new United States federal government. In 1855, the Portsmouth and Norfolk area suffered an epidemic of yellow fever which killed 1 of every three citizens. It became an independent city from Norfolk County in 1858. During the American Civil War, in 1861, Virginia joined the Confederate States of America. Fearing that the Confederacy would take control of the shipyard at Portsmouth, the shipyard commander ordered the burning of the shipyard. The Confederate forces did in fact take over the shipyard, and did so without armed conflict through an elaborate ruse orchestrated by civilian railroad builder William Mahone (soon to become a famous Confederate officer). The Union forces withdrew to Fort Monroe across Hampton Roads, which was the only land in the area which remained under Union control. In early 1862, the Confederate ironclad warship CSS Virginia was rebuilt using the burned-out hulk of USS Merrimack. Virginia engaged the Union ironclad USS Monitor in the famous Battle of Hampton Roads during the Union blockade of Hampton Roads. The Confederates burned the shipyard again when they left in May 1862. Portsmouth was the county seat of Norfolk County until 1963 when the new city of Chesapeake was formed in a political consolidation with the city of South Norfolk. Portsmouth's other county neighbor, the former Nansemond County, also consolidated with a smaller city, forming the new city of Suffolk in 1974. One of the older cities of Hampton Roads, in the early 21st century, Portsmouth was undergoing moderate urban renewal in the downtown. The APM "MAERSK" marine terminal for container ships opened in 2007 in the West Norfolk section. 1752 - Portsmouth founded by politician William Crawford; named after Portsmouth, England. 1779 - Portsmouth sacked by British forces during the American Revolutionary War. 1812 - Dismal Swamp Canal opens. 1822 - Norfolk-Portsmouth steam ferry begins operating. 1824 - October 25: Lafayette visits Portsmouth. 1836 - Town of Portsmouth incorporated. 1837 - Portsmouth & Roanoke Railroad begins operating. 1846 - Norfolk County Courthouse built. 1855 - Yellow fever outbreak. 1858 - City of Portsmouth incorporated as an independent city (separated from Norfolk County). 1865 - Zion Baptist Church founded. 1867 - Virginia Baptist State Convention organized during a meeting in Portsmouth. 1900 - Lyceum Theatre in business. 1914 - Portsmouth Public Library opens. 1922 - Chevra Thilim Synagogue built. 1939 - Lyric Theatre in business. 1949 - Portsmouth Naval Shipyard Museum established. 1952 - Downtown Tunnel opens. 1955 - Portsmouth Historical Association founded. 1957 - WAVY-TV begins broadcasting. 1963 - Public Library's "Local History Room" established. 1966 - Virginia Sports Hall of Fame and Museum established. 1974 - Richard Joseph Davis becomes mayor. 1981 - Portsmouth Times newspaper begins publication. 1984 - James W. Holley, III becomes mayor. 1993 - Bobby Scott becomes U.S. representative for Virginia's 3rd congressional district. 1998 - Museum of Military History established. 2001 - Randy Forbes becomes U.S. representative for Virginia's 4th congressional district. 2017 - John L. Rowe, Jr. becomes mayor. Built in 1846, the Portsmouth Courthouse is a historic landmark in the center of the Olde Towne Historic District. The Olde Towne Historic District features one of the largest collections of historically significant homes between Alexandria, Virginia and Charleston, South Carolina. The Emanuel African Methodist Episcopal Church was built by slaves and free men and is the second-oldest building in Portsmouth and the city's oldest black church. The city contains a number of other historic buildings, as well, including the Pass House, which was built in 1841 by Judge James Murdaugh and occupied by Union troops from 1862 to 1865. Federal forces required Portsmouth residents to obtain a written pass to travel across the Elizabeth River and beyond. These passes were issued from the English basement and thus the name "Pass House" was derived. Formerly the Naval Hospital Portsmouth, the Naval Medical Center Portsmouth is a United States Navy medical center adjacent to the Olde Towne Historic District and Park View Historic District. Founded in 1827, it is the oldest continuously running hospital in the Navy medical system with the motto "First and Finest." Located at 1 High Street in the Olde Towne Historic District, the Seaboard Coastline Building is a historic train station and former headquarters of the Seaboard Air Line railroad company. A four-story 1825 English basement home furnished entirely with original family belongings. It is evident from the furnishings that the Hill family were avid collectors and lived graciously over a period of 150 years. The house remains in its original condition, with limited renovation through the years. Established in 1832, Cedar Grove Cemetery is the oldest city-owned cemetery in Portsmouth. Listed on the National Register of Historic Places listings in Portsmouth, Virginia, the cemetery is noted for its funerary art and the civic, business, maritime, religious and military leaders who are buried there. Historical markers placed throughout the cemetery allow for self-guided tours. The cemetery is located between Effingham Street and Fort Lane in Olde Towne Portsmouth. Entrance is through the south gate to the cemetery, located on London Boulevard. Portsmouth's mild humid subtropical climate means outdoor activities can be enjoyed year round. The weather in Portsmouth is temperate and seasonal. Summers are hot and humid with warm evenings. The mean annual temperature is 65 °F (18 °C), with an average annual snowfall of 3 inches and an average annual rainfall of 47 inches. No measurable snow fell in 1999. The wettest seasons are the spring and summer, although rainfall is fairly constant all year round. The highest recorded temperature was 105.0 °F in 1980. The lowest recorded temperature was -3.0 °F on January 21, 1985. Additionally, the geographic location of the city, with respect to the principal storm tracks, is especially favorable, as it is south of the average path of storms originating in the higher latitudes, and north of the usual tracks of hurricanes and other major tropical storms. Snow falls rarely, averaging 3 inches (76 mm) per season. As of the census of 2010, there were 95,535 people, 38,170 households, and 25,497 families residing in the city. The population density was 3,032.7 people per square mile (1,170.9/km²). There were 41,605 housing units at an average density of 1,254.7 per square mile (484.4/km²). The racial makeup of the city was 53.3% African American, 41.6% White, 0.4% Native American, 1.1% Asian, 0.1% Pacific Islander, 1.0% from other races, and 2.6% from two or more races. Hispanic or Latino of any race were 3.1% of the population. There were 38,170 households out of which 30.6% had children under the age of 18 living with them, 41.1% were married couples living together, 10.9% have a female household with no husband present and 33.2% were non-families. 27.5% of all households were made up of individuals and 10.8% had someone living alone who was 65 years of age or older. The average household size was 2.51 and the average family size was 3.05. In the city, the population was spread out with 25.7% under the age of 18, 11.1% from 18 to 24, 29.1% from 25 to 44, 20.3% from 45 to 64, and 13.8% who were 65 years of age or older. The median age was 34 years. For every 100 females, there were 93.5 males. For every 100 females age 18 and over, there were 90.6 males. The median income for a household in the city was $46,340, and the median income for a family was $53,769. Males had a median income of $39,871 versus $33,140 for females. The per capita income for the city was $23,108. About 13.5% of families and 16.7% of the population were below the poverty line, including 27.1% of those under age 18 and 10.8% of those age 65 or over. Portsmouth has a long history as a port town and city. The Olde Towne Business and Historical District is located in the downtown area, where a combination of preservation and redevelopment has been underway. An example is Hawthorn Hotel & Suites at The Governor Dinwiddie Hotel, which was renovated and reopened in 2005 after being closed for more than 10 years. It has been recognized by Historic Hotels of America, a program of the National Trust for Historical Preservation that identifies hotels that have maintained their historical integrity, architecture and ambiance and provides resources for their preservation. The historic hotel was named for Governor Robert Dinwiddie, who was the administrative head of the Colony of Virginia during the time Portsmouth was founded in 1752. It was largely through his efforts that Virginia survived the French and Indian War relatively well. (Dinwiddie County near Petersburg was also named for him). Other points of interest include the Portsmouth City Park, featuring the 2 ft (610 mm) narrow gauge Portsmouth City Railroad with an operating Chance Rides C.P. Huntington locomotive named Pokey Smokey II. The original Pokey Smokey locomotive was built by Crown Metal Products and ran at the park for many years before being sold at auction. It now runs on the Mideast Railroad in Ederville in Carthage, North Carolina. The Portsmouth Cavaliers were a basketball team founded in 2010 and played in the American Basketball Association for the 2011-12 season. Based in Portsmouth, Virginia, the Cavaliers played their home games at the Chick-fil-A Fieldhouse on the campus of Portsmouth Catholic Regional School. The club spent one season in the American Professional Basketball League (APBL) before folding. Portsmouth is governed under the Council-Manager form of government. The current mayor is John Rowe, who was elected November 8, 2016. The City Hall Building, located at 801 Crawford Street, is the regular meeting place of the City Council of The City of Portsmouth, Virginia. The City Council is a legislative body served by six members, elected for four-year terms. Portsmouth Public Schools operates public schools. There are three public high schools in Portsmouth, Virginia, located at three corners of the city. In the northwest section of the city, off Cedar Lane, is Churchland High School. In the downtown section of the city, between London Blvd and High Street, is I.C. Norcom High School. In the southwest section of Portsmouth, on Elmhurst Lane, is Woodrow Wilson High School. There are a number of institutions of higher education in and within close proximity to Portsmouth. The city is home to the Tri-Cities Higher Education Center of Old Dominion University (ODU), a public research university founded in 1930 whose main campus is located in Norfolk, Virginia. Portsmouth is also home to the Fred W. Beazley Portsmouth Campus of Tidewater Community College, a two-year higher education institution founded in 1968 in South Hampton Roads with additional campuses located in Chesapeake, Norfolk, and Virginia Beach. Portsmouth's daily newspaper is the Virginian-Pilot with The Currents being the Portsmouth edition of the Sunday paper. Other papers include the New Journal and Guide, and the Hampton Roads Business Journal. Hampton Roads Magazine serves as a bi-monthly regional magazine for Portsmouth and the Hampton Roads area. The Hampton Roads Times serves as an online magazine for all the Hampton Roads cities and counties. Portsmouth is served by a variety of radio stations on the AM and FM dials, with towers located around the Hampton Roads area. Portsmouth is also served by several television stations. The Hampton Roads designated market area (DMA) is the 42nd largest in the U.S. with 712,790 homes (0.64% of the total U.S.). The major network television affiliates are WTKR-TV 3 (CBS), WAVY 10 (NBC), WVEC-TV 13 (ABC), WGNT 27 (CW), WTVZ 33 (MyNetworkTV), WVBT 43 (Fox), and WPXV 49 (ION Television). The Public Broadcasting Service stations are WHRO-TV 15, Hampton/Norfolk and WUND-TV 2, Edenton, NC. Portsmouth residents also can receive independent stations, such as WSKY broadcasting on channel 4 from the Outer Banks of North Carolina and WGBS-LD broadcasting on channel 11 from Hampton. Portsmouth is served by Cox Cable and Verizon FIOS. DirecTV and Dish Network are also popular as an alternative to cable television in Portsmouth. WAVY-TV and WVBT-TV are both sister stations owned by Nexstar and have their office and studio located in the city. From the earliest development, Portsmouth has been oriented to the water. In the 1830s, it was the first community in Hampton Roads to receive a new land transportation innovation, railroad service. The Portsmouth and Roanoke Railroad, a predecessor of the Seaboard Air Line Railroad, extended to the rapids of the Roanoke River on its fall line near Weldon, North Carolina. It was to be 20 more years before its bigger neighbor, the city of Norfolk, also received a rail line, in 1858, when the Norfolk and Petersburg Railroad was completed. Portsmouth is primarily served by the Norfolk International Airport (IATA: ORF, ICAO: KORF, FAA LID: ORF), now the region's major commercial airport. The airport is located near Chesapeake Bay, along the city limits of neighboring Norfolk and Virginia Beach. Seven airlines provide nonstop services to twenty-five destinations. ORF had 3,703,664 passengers take off or land at its facility and 68,778,934 pounds of cargo were processed through its facilities. Newport News/Williamsburg International Airport (IATA: PHF, ICAO: KPHF, FAA LID: PHF) also provides commercial air service for the Hampton Roads area. The Chesapeake Regional Airport provides general aviation services and is located five miles (8 km) outside the city limits. In the 21st century, the city has access to lines of CSX Transportation, Norfolk Southern and three short line railroads. Portsmouth is served by Interstate 264 and Interstate 664, which is part of the Hampton Roads Beltway. U.S. Route 17 and U.S. Route 58 pass through. The Elizabeth River is crossed via the Midtown Tunnel, the Downtown Tunnel and Berkley Bridge combination. Transportation within the city, as well as the other cities of Hampton Roads, is served by a regional bus service, Hampton Roads Transit. Parthenia M. Hicks (Patsy) Poet, writer, editor. Poet Laureate Los Gatos, CA. Robinson Jeffers Tor House recipient; Montalvo Poetry Award; Silicon Valley Creates Fellowship. Dragonfly Press Award. Editor Song of Los Gatos. ^ Baker, Barnabas W.; Burgess, Dean. "William Craford (d. by April 15, 1762)". Encyclopedia Virginia. Retrieved 22 June 2015. ^ a b c "Maps and Formation Information: Portsmouth". County and City Records. Richmond: Library of Virginia. Retrieved March 18, 2017. ^ Federal Writers' Project 1941. ^ "Encyclopedia Virginia". Charlottesville: Virginia Foundation for the Humanities. Retrieved March 17, 2017. ^ a b "Movie Theaters in Portsmouth, VA". CinemaTreasures.org. Los Angeles: Cinema Treasures LLC. Retrieved March 18, 2017. 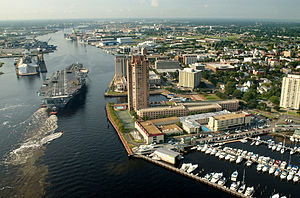 ^ "Portsmouth, Virginia". Encyclopedia of Southern Jewish Communities. Jackson, Mississippi: Goldring / Woldenberg Institute of Southern Jewish Life. Retrieved March 18, 2017. ^ a b c American Association for State and Local History (2002). "Virginia: Portsmouth". Directory of Historical Organizations in the United States and Canada (15th ed.). p. 830. ISBN 0759100020. ^ "Local History". Portsmouth Public Library. Retrieved March 18, 2017. ^ "US Newspaper Directory". Chronicling America. Washington DC: Library of Congress. Retrieved March 18, 2017. ^ "Virginia". Official Congressional Directory. Washington, D.C.: Government Printing Office. 2002. ^ "Portsmouth city, Virginia". QuickFacts. U.S. Census Bureau. Retrieved March 18, 2017. ^ a b "City Council". City of Portsmouth. Retrieved March 18, 2017. ^ "Med.navy.mil". Naval Medical Center Portsmouth. US Navy. Retrieved June 11, 2016. ^ "Quick Data View Norfolk." National Oceanic and Atmospheric Administration. 1971–2000. ^ Esther, Audrey (30 December 2016). "'It's a new day in Portsmouth,' says new mayor John Rowe". WVEC. Retrieved 16 February 2017. ^ "Mayors of Portsmouth". Sketch Book of Portsmouth, Va: Its People and Its Trade. Portsmouth: Edward Pollock. 1886. ^ a b c William H. Stewart (1902). "Mayors of Portsmouth". History of Norfolk County, Virginia and Representative Citizens. Chicago: Biographical Publishing Company. ^ "About ODU - Old Dominion University". ODU. Retrieved 2012-11-13. ^ "About Tidewater Community College". TCC. Retrieved 2012-11-13. ^ "Hampton Roads Magazine". Hampton Roads Magazine. Retrieved 2007-08-06. ^ "Norfolk International Airport Mission and History". Norfolk International Airport. Archived from the original on September 28, 2007. Retrieved 2007-10-02. ^ "Norfolk International Airport Statistics" (PDF). Norfolk International Airport. Archived from the original (PDF) on October 25, 2007. Retrieved 2007-10-02. ^ "Newport News/Williamsburg International Airport". Newport News/Williamsburg International Airport. Archived from the original on 2000-12-04. Retrieved 2008-02-25. ^ "Chesapeake Regional Airport". Retrieved 2008-01-12. ^ Campbell, Edward D. C., Jr. (July 8, 2013). "V. C. Andrews (1923-1986)". Dictionary of Virginia Biography. Encyclopedia Virginia. ^ Gulla, Bob (2008). Icons of R&B and Soul, p. 72. Greenwood Publishing Group. ^ "49th TCC Commencement". Tidewater Community College. October 27, 2009. ^ "Jamin Elliott, WR at NFL.com". National Football League. ^ "Missy Elliott Biography". The Biography.com website. A&E Television Networks. ^ "Perry Ellis Biography". The Biography.com website. A&E Television Networks. ^ Gerber, Alan Jay (January 19, 2012). "The Kosher Bookworm From Portsmouth Virginia to Telz The Legacy of Rabbi Mordechai Gifter". The Jewish Star. ^ Litsky, Frank (November 12, 2004). "Chandler Harper, Winner of 7 Professional Golf Tournaments, Dies at 90". The New York Times. ^ Forster, Dave; Harki, Gary (October 6, 2012). "Former Portsmouth Mayor James Holley dies at 85". The Virginian-Pilot. ^ Baker, Peter (February 4, 1991). "Va. City Lays Claim to War's 1st Hero". The Washington Post. ^ "Ben Jones: A Conversation". Georgia Public Broadcasting. ^ "Finishing Welles' film became her mission". Los Angeles Times. December 21, 2007. ^ Hevesi, Dennis. "Jack T. Kirby, Southern Historian, Dies at 70", The New York Times, August 13, 2009. Accessed August 14, 2009. ^ Washington, Nicholas L. (April 15, 2014). "Nathan McCall: 20 Years After 'Makes Me Wanna Holler'". Ebony. ^ "Pete Mikolajewski". Profootballarchives.com. Retrieved October 30, 2015. ^ Bernstein, Adam (May 1, 2007). "Jazz Saxophonist Tommy Newsom; Played on 'Tonight Show'". The Washington Post. ^ "Patton Oswalt Biography". biography.com. A&E Television Networks. Retrieved 16 February 2017. William S. Forrest (1853). Historical and Descriptive Sketches of Norfolk and Vicinity, Including Portsmouth. Philadelphia: Lindsay and Blakiston. William S. Forrest (1856). Great Pestilence in Virginia...Yellow Fever in Norfolk and Portsmouth in 1855. New York: Derby & Jackson. Sketch Book of Portsmouth, Va: Its People and Its Trade. Portsmouth: Edward Pollock. 1886. Robert W. Lamb, ed. (1888). Our Twin Cities of the Nineteenth Century (Norfolk and Portsmouth). Barcroft. William H. Stewart (1902). History of Norfolk County, Virginia and Representative Citizens. Chicago: Biographical Publishing Company. Cassandra Newby-Alexander; et al. (2003). Portsmouth, Virginia. Black America. Charleston, South Carolina: Arcadia. Paul T. Hellmann (2006). "Virginia: Portsmouth". Historical Gazetteer of the United States. Taylor & Francis. pp. 1159–1160. ISBN 1-135-94859-3. Wikimedia Commons has media related to Portsmouth, Virginia. Wikisource has the text of a 1911 Encyclopædia Britannica article about Portsmouth, Virginia. "City of Portsmouth". County and City Records. Richmond: Library of Virginia.